If you’re moving to London from the US after college you need to find out a little more about how to handle your finances after the big move. The same is true for young people moving from Australia and moving here from Ireland. After you are settled into your new apartment, you’ll be heading off to the ‘city’ to earn your crust. Moving to and working in London will be quite different to what you are used to. One of the biggest differences is the way that you are taxed in the UK. Learning about tax when you’re moving to London can save you hundreds of pounds each year. It’s a good idea to have an understanding of the way taxes work as part of your relocation to London. How will your income be affected in a country other than your own? Each tax year is from April 6 in any year to April 5 of the next year. Income Tax is payable by both employed- and self-employed individuals who earn above a specific level. In the United Kingdom, all of your benefits will be taxed. This includes State-, Company- and Personal Pensions, as well as benefits such as a Jobseeker’s Allowance, Weekly Bereavement Allowance, Carer’s Allowance and the Incapacity Benefit. Interest on most savings, dividends, rental income of more than £4,250 a year (£2,215 if split jointly) and income received from a trust, etc. are tax deductable. In addition to paying Income Tax, you are also required to pay National Insurance Contributions (NICs). Tax is generally paid each time you are paid by your employer; this is known as pay-as-you-earn (PAYE). As a foreigner moving to London, you need to make sure that you have a good tax advisor to help you with your tax requirements in the UK as well as your existing tax requirements back home. Don’t be caught short by paying double tax! The tax laws in the UK allow a great deal of leeway and a good tax advisor will help you get as much back in the form of tax credits and exemptions. 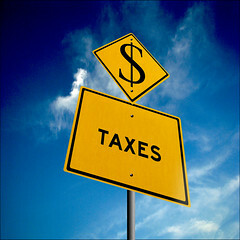 All taxpayers are allowed a certain amount of tax-free income (a Personal Allowance). There are also other forms of non-taxable income. If you are a full-time student working only during the holiday periods and you expect to earn less than the Personal Allowance during the whole of the next tax year (until 5 April) and intend to continue studying until after 5 April of the following year, you may apply to receive your wages without tax being deducted. Don’t get caught short after moving to London from the US; plan ahead and spend time enjoying the city rather than sweating over your tax return.